Marco Rubio is the betting markets' top-pick to win the Republican presidential nomination, and he's polling the best among the candidates most closely aligned with the party's establishment. But with the first votes less than a month away in the primary contest, his campaign is in search of an early victory with which to stake his claim to that front-runner status. "Rubio's biggest concern is: Where do I get an early win?" says GOP strategist Ford O'Connell. "That is what is keeping them up at night." The answer is looking increasingly like Nevada. The problem is that Rubio's currently trailing badly in the polls there, and his best shot at early momentum is an uphill climb. Of course, other campaigns are getting the same idea. Trump and Cruz, whose campaign is ramping up its efforts in Nevada, both lead Rubio in the latest poll in the state. Polling in Nevada has been sparse, and it's notoriously difficult to predict the outcome of caucuses with statewide polls. But the numbers in the latest survey show Rubio 22 points behind Trump and 9 points behind Cruz—hardly a front-runner position. Cruz, who is currently the favorite to win Iowa, is banking on the heavily Southern Super Tuesday states to win the nomination—a strategy all the more likely if he wins Nevada. "Cruz wants to have two wins underneath his belt" ahead of Super Tuesday, says O'Connell. "If he can sway evangelicals away from the Trump phenomenon going into the South, he's in much better shape." For months, Cruz has been talking about the federal government's massive land holdings in the West, an issue that, as O'Connell points out, is a big deal in Nevada. And, like Rubio, he has enlisted prominent Mormons to help him win over that demographic. Sen. Ted Cruz (R-Texas) is making a play for the West in the 2016 race by touting his opposition to the federal government’s expansive land holdings. Cruz’s disdain for federal land control is resonating with Westerners whose lives are impacted by land managers, and could help him win over conservatives in Nevada, one of the early nominating states in the presidential contest. Nationwide, the government owns nearly 630 million acres, a landmass bigger than Alaska and California combined. Most of that land, managed by agencies like the Bureau of Land Management and Forest Service, is located in states west of the Mississippi River. O’Connell said Nevada is especially receptive to issues of land rights, and said opposing federal control could play “extremely well” there for Cruz. “He really needs to get some traction, because he’s lingering in the polls, and he needs some elbow room in this potentially crowded field,” he said. Nevada could be critical for the senator, as it traditionally follows Iowa and New Hampshire in the early stretch of nominating states. It was third on the GOP presidential calendar in 2012, and is tentatively scheduled to be fourth in 2016. Early polling indicates Cruz has a real shot in the state. GOP presidential hopefuls are largely steering clear of Nevada rancher Cliven Bundy’s fight with the federal government. The showdown, which left armed militia members and feds staring each other down last week, has captivated talk radio and cable news shows, turning Bundy into a conservative cause célèbre. Yet Sen. Rand Paul (R-Ky.) and former Arkansas Governor and 2008 presidential candidate Mike Huckabee are the only big-name GOP stars to have spoken out on the dispute so far. Tea Party favorite Sen. Ted Cruz (R-Texas) has been silent, and Sen. Marco Rubio (R-Fla.) and Rep. Paul Ryan (R-Wis.) have also not commented on Bundy, who has been fighting the federal government in and out of court for more than 20 years over his refusal to pay grazing fees. All three offices did not respond to calls for this story. GOP strategists suggested that Bundy’s case is far too risky for most candidates eyeing the presidency, particularly given the possibility of armed conflict with federal police. Paul has a libertarian bent to his politics, and he’s repeatedly taken on issues that make the Bundy fight work better for him than others, O’Connell said. A few words about all of these polls on the presidential race in Nevada: Don’t believe them. You hear the cliché all the time that polls are snapshots in time. That is true, but it also highlights the basic problem with most polls. That snapshot may be worth a thousand words, but only when the picture is taken. So the best pollsters – this is the key – know how to weight the results to fit the picture that will exist on Election Day – that is, what the turnout actually will look like. Despite what all of those polls say, Romney's path to victory in Nevada now is much more problematic than any Republican will acknowledge. [A] Globe analysis of voter registration data in swing states reveals scant evidence that the massive undertaking is yielding much fresh support for Obama. In Florida, Iowa, North Carolina, Colorado, and Nevada — tossup states where direct election-year comparisons could be drawn — the numbers are striking. Democratic rolls increased by only 39,580, less than one-tenth the amount at the comparable point in the 2008 election. The Obama campaign downplayed the Globe’s findings. “The fact is, there are currently many more Democrats registered in battleground states now than there were before the 2008 primary campaign began, which means there are fewer eligible voters left to register because of the gains we made in 2008,” campaign spokesman Adam Fetcher said in an e-mail. After years of quiet, relentless organizing, followers of libertarian-leaning GOP presidential candidate Ron Paul have exploded inside the Minnesota Republican Party, becoming its most potent army. "This is one of the greatest states that I have witnessed, where I have seen the transition, where the enthusiasm's there," the grinning Texas congressman told hundreds of exuberant activists Saturday at the state party's convention in St. Cloud, where he won 12 of 13 open delegate spots to the GOP national convention in Tampa, Fla., in August. The 13th went to former presidential candidate and U.S. Rep. Michele Bachmann -- and only after a Paul supporter dropped out to let her have that spot. In Minnesota, more than almost any other state, Paul forces have completed a historic party takeover. They proved their might Saturday, but also firmly established Minnesota as a remote GOP outpost nationally. Now state GOP activists will march to the national convention firmly backing Paul rather than presumed Republican presidential nominee Mitt Romney. Fed up with an inept and self-destructive GOP apparatus in Nevada, the Republican National Committee and the Mitt Romney campaign have decided to erect a “shadow state party” in this critical swing state, sources confirmed today. Priebus was described to me as “disappointed with the censuring,” which probably means his blood pressure went high enough to give an elephant a stroke. So Priebus, in concert with the Romney folks here, have decided to turn the so-called Team Nevada office on Tropicana into the de facto Republican Party. “The goal is for us to be running get out the vote, running phone programs, voter ID, voter contact, everything through the Team Nevada headquarters,” the strategist told me. That is, everything the party is supposed to do, except the GOP here can’t raise money and has the inmates running the asylum. 270 Electoral Votes are needed to win the White House. President Obama has an electoral edge (242 Electoral Votes) over presumptive GOP nominee Mitt Romney (191 Electoral Votes) at this stage. Below are a list of the true swing states, according to AP. Colorado (9) — Long a reliable GOP state, but Colorado's conservative profile is changing. An influx of young professionals and Hispanic voters were keys to Obama's victory in 2008. The economy has hurt him standing. Female voters in vote-rich Denver suburbs are likely to be key. Florida (29) — Florida is the prime target for both campaigns. Obama won in 2008, but the housing crisis, high unemployment and gas prices are dogging him. Romney won the primary in January and has picked up endorsement of freshman Sen. Marco Rubio. Obama's organization has a big advantage six months out. Iowa (6) — An important George W. Bush-state pick-up for Obama. Iowa has been a national popular vote bellwether for 20 years. Obama's attention in the state where his caucus victory launched him in 2008 is countered by Romney's two caucus campaigns. Conservatives are leery of Romney's Mormon faith and social issue profile, but he's got pro-business GOP Gov. Terry Branstad on his side. New Hampshire (4) — Romney's backyard and vacation home. He won the 2012 primary big, but Obama peeled off this Bush state in 2008 and has worked hard to keep it. Vice President Joe Biden visited Friday. But the GOP is back in power in Legislature, and new Sen. Kelly Ayotte is seen as asset for Romney. New Mexico (5) — New Mexico emerged as a swing state in the past decade. Democrat Al Gore, then Bush, then Obama carried it. An influx of Hispanic and younger voters has Obama team confident. Gov. Susana Martinez, a rising GOP star elected in 2010, gives the Romney team hope. Nevada (6) — Part of a triad of Southwestern states Obama flipped in 2008. Nevada is also the prime example of the economy's struggles. Unemployment was 12.3 percent in February, a point Romney will press. There's a strong labor and Hispanic vote, a plus for Obama. A higher Mormon population helps Romney. North Carolina (15) — Obama was the first Democrat to win North Carolina in 32 years and he hopes again to turn out a high percentage of newcomers and minorities. Romney is contesting the state, an outlier for Obama in 2008, aides say. Obama hopes that holding the party's national convention in Charlotte in September proves a boost. Ohio (18) — The ultimate Midwestern swing state has been a general election bellwether since 1980. Romney won the 2012 primary and has support from establishment figures such as Sen. Rob Portman. Obama has the organizing advantage, although the economy remains a sticking point, especially in the industrial northwest. Virginia (13) — Long a GOP bastion, Obama carried Virginia in 2008 by turning out young and minority voters. An influx of under-35 crowd, especially from the Washington, D.C., area, has continued. But Republicans roared back in 2010, ending consecutive Democratic administrations in governorship by electing up-and-comer Bob McDonnell. What happens in Vegas, stays in Vegas. And Republican Newt Gingrich certainly will hope the disarray that marred his campaign in Nevada last week will not doom his White House bid as he heads toward a possible Super Tuesday last-stand next month. Stinging losses to Mitt Romney in Florida and Nevada within a week have sucked much of the energy from the former House speaker's shot at the Republican nomination to challenge President Barack Obama in the November 6 general election. The negative television ads so successful in siphoning Gingrich support in Florida followed him to Nevada. Romney's well-funded campaign, and backing from a political action committee run by Romney supporters, will no doubt continue the blitz. There might be a point beyond which Gingrich, who many observers think entered the presidential race mostly to burnish his reputation as a conservative elder-statesman, can no longer stomach the daily attacks. Republican strategist Ford O'Connell said Gingrich had lost control of his emotions at times. "Gingrich should not have let Romney get into his head," O'Connell said. "That was a killer. When he's angry, he is his own worst enemy." Strategists said Gingrich's biggest challenge is that he never laid the foundation of a campaign in the first place, especially after much of his staff quit in early June. "The best opening for him between now and Super Tuesday is money, discipline and organization," O'Connell said. 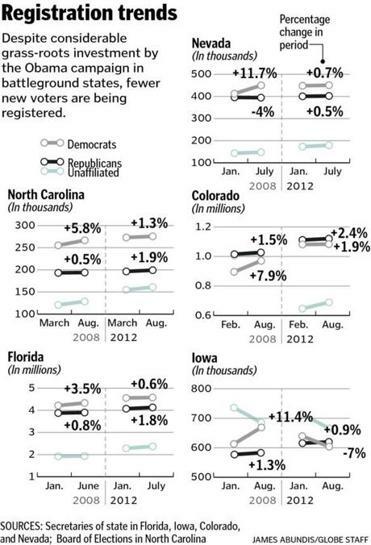 Which 2012 Presidential Swing States Are Most Up For Grabs? Things can always change, and between now and Election Day 2012 they will several times over. But I have to hand it to Fox News' Chris Stirewalt, his current presidential swing state analysis is on the mark. Of course, much of this depends on the state of the economy on Election Day 2012 and who GOP primary voters nominate as the party's standard-bearer. Note: I am fairly certain that New Mexico will go for Obama, at least for now. While Obama continues to tie or lead national polls, his performance in Colorado, Florida, Iowa, Michigan, Nevada, New Hampshire, New Mexico, North Carolina, Ohio, Pennsylvania, Virginia and Wisconsin matters more. And there, things are not so good for the incumbent. Obama won all 12 of the swing states in 2008, but how many of them will he win again? He has structural advantages and history on his side in Michigan, Wisconsin and Pennsylvania (though all three states skewed heavily Republican statewide in 2010). Polls and electoral trends suggest the president is unlikely to prevail in Florida, Iowa, New Hampshire and North Carolina. That leaves Colorado, Nevada, New Mexico, Ohio and Virginia as the swingingest swing states and Obama trailing in electoral votes 245 to 242 with 51 up for grabs. And there, team Obama will be counting on the most expensive, aggressive and negative re-election campaign ever waged. And that’s where there’s real trouble in the poll for Obama in this poll. Since 2008, swing state voters have become 9 percent less Democratic. When Obama won the swing states by 8 points, Democrats boasted an 11-point party identification edge. Now it’s down to 2-points.